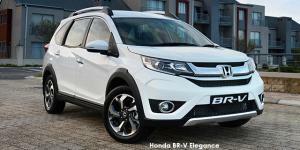 The Honda BR-V is a popular choice at Mekor Honda Tygerberg, as it packs so much into an affordable SUV. The sporty look is due to its clean lines, sleek roof rails and a powerful stance. The Honda BR-V sets a high standard in safety with its exclusive ACE body structure enhancing self-protection. The spacious interior sets the Honda BR-V apart. With three rows of premium leather seating available in all variants, 7 passengers are able to travel in comfort and style while still leaving room for storage in the boot. The Honda BR-V is available in either a 1.5L i-DTEC diesel engine, offering power of 100ps, or a 1.5L i-VTEC petrol engine with 6-speed manual transmission or CVT. For a spacious, premium economy drive that the Honda BR-V can offer you, visit Mekor Honda at Mekor Honda Tygerberg for Cape Town Northern Suburbs, Stellenbosch and Somerset West for more details.